Digital menu boards are no longer a rare find, there’s been a huge increase within the restaurant industry as well as nightclubs and bars. However, it doesn’t stop there, even convenience stores and grocery stores are adopting the use of these screens in order to upsell and showcase offers and promotions. You may be curious as to the benefit of these boards and how they can make you money? The TouchMenu system offers the opportunity to swap out content quickly with little effort. 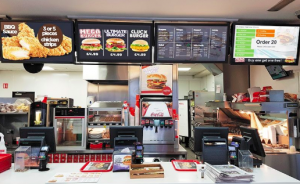 These digital menus can also assist in eliminating customer wait times as they can proactively use screens to look at menus, promotions and offers. Immediate changes to menus can be made, so if the kitchen is running low on a particular item, or if you need to push an option that isn’t selling, it’s easy to make immediate updates. Gone are the days where menus would remain the same years on year, now they’re changed, adapted and re priced multiple times each year. Ingredients need updating, food costs change, seasonal items need modernising, some restaurants even offer weekly specials. There’s multiple reasons why a menu would need re printing and replacing and every time is an additional cost.